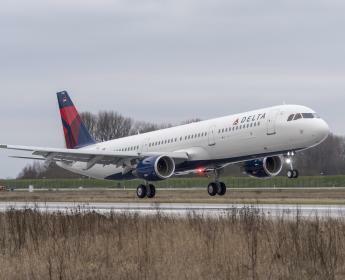 Delta and Airbus SE have agreed to augment Delta’s order of narrowbody Airbus A321s by 10 additional aircraft, bringing the total number of A321s on order to 122. The move adds to an already expanded order announced in May. Delta’s A321s feature high-capacity overhead bins, the latest in in-flight entertainment, full spectrum LED ambient lighting, standard 110v power available at every row, as well as in-flight Wi-Fi and Delta Studio. The A321s will also feature wingtip Sharklets, which will provide up to 4 percent improvement in fuel efficiency.